Donald Trump is increasingly alone in his party due to the separation of undocumented immigrant parents and children at the border. 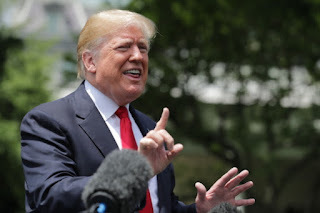 The US president vehemently defended his policy on Tuesday and redoubled his speech on the demonization of immigration despite growing pressure from Republican lawmakers, prominent conservative voices and the US Chamber of Commerce asking him to end family breakups. The migratory controversy threatens to become a headache for the Republicans and unleash an internal breach five months before the legislative elections. While a defiant Trump was still refusing to end the separation policy on its own, some first steps were taken in that direction in Congress, although there are major differences on how to achieve it. The Senate Republican leader, Mitch McConnell, announced that all 51 Republican senators support a bill to "keep together" families of undocumented immigrants after being detained for illegally crossing the border. "We are going to solve the problem," he said. And he advanced that he looks for an agreement this week with the democratic opposition. However, the leader of the progressive bloc, Chuck Schumer, replied that the conservative initiative "does not make sense" to remember that Trump can end on his own with the policy without depending on Congress. Despite the president's constant attempts to falsely blame the Democrats, there is no law that requires the Administration to separate parents and children. It is a consequence of the decision of the Prosecutor's Office in April to file criminal charges against any adult who enters the United States illegally. Since minors can not enter prison, they are separated. Since April, more than 2,000 children have been segregated from their parents. Republicans in the House of Representatives are studying a draft bill that would keep those parents and immigrant children together in custody if they have no criminal record but the detention would be extended for longer than the current one, according to legislative sources cited by US media. It is unclear if both proposals would go forward in both legislative chambers but evidence the growing consensus to tackle the crisis. Trump met in the afternoon with the Republican legislators of the House of Representatives in a meeting marked by immigration. The White House said, without going into details, that the president supported two Republican bills, announced last week, on immigration. The initiatives, one more conservative than the other, indirectly address the separation of immigrant parents and children but as part of a legislative package that includes measures to tighten immigration conditions and border security, including funds for the wall that Trump wants to build with Mexico.